The play opens with Betsy describing a society feast, as the characters are introduced and we learn of their various problems. In particular, there is Prince Stepan Arkadyevitch Oblonsky, "Stiva", a Moscow aristocrat and civil servant who has been unfaithful to his wife Darya Alexandrovna, nicknamed "Dolly". Dolly has discovered his affair - with the family's governess - and the house and family are in turmoil. Meanwhile, Stiva's childhood friend Konstantin Dmitrievich Levin ("Kostya") arrives in Moscow with the aim of proposing to Dolly's youngest sister Princess Katerina Alexandrovna Shcherbatskaya, "Kitty". Levin is a passionate, restless, but shy aristocratic landowner who, unlike his Moscow friends, chooses to live in the country on his large estate. He discovers that Kitty is also being pursued by Count Alexei Kirillovich Vronsky, an army officer. In the midst of the turmoil, Stiva's married sister, Anna Arkadyevna Karenina is coming to visit from Saint Petersburg. At the railway station to meet Anna, Stiva bumps into Vronsky. Vronsky is there to meet his mother, Countess Vronskaya. Anna and the Countess Vronskaya have travelled together in the same carriage and talked together. As the family members are reunited, and Vronsky sees Anna for the first time, a woman jumps in front of a train and is killed. They say she has been waiting for her lover to return, day upon day. Anna is darkly fascinated by someone who would die for love. Vronsky immediately becomes infatuated with Anna. Anna, who is uneasy about leaving her young son, Seryozha, alone for the first time, talks openly and emotionally to Dolly about Stiva's affair and convinces Dolly that her husband still loves her, despite his infidelity. Dolly is moved by Anna's speeches and decides to forgive Stiva. Dolly's youngest sister, Kitty, comes to visit her sister and Anna. Kitty, just 18, is in her first season as a debutante and is expected to make an excellent match with a man of her social standing. Vronsky has been paying her considerable attention, and she expects to dance with him at a ball that evening. Kitty is very struck by Anna's beauty and personality. When Levin proposes to Kitty at the ball, she clumsily turns him down, because she believes she is in love with Vronsky and that he will propose to her. At the ball, Vronsky pays Anna considerable attention, and dances with her, choosing her as a partner instead of Kitty, who is shocked and heartbroken. Kitty realises that Vronsky has fallen in love with Anna, and that despite his overt flirtations with her he has no intention of marrying her and in fact views his attentions to her as mere amusement, believing that she does the same. Anna, shaken by her emotional and physical response to Vronsky, returns at once to Saint Petersburg. Vronsky travels on the same train. During the overnight journey, the two meet and Vronsky confesses his love. Anna refuses him, although she is deeply affected by his attentions to her. Levin, crushed by Kitty's refusal, returns to his estate farm, abandoning any hope of marriage, and Anna returns to her husband Alexei Alexandrovich Karenin, a senior government official, and their son Sergei ("Seryozha") in Petersburg. In St. Petersburg, Anna begins to spend more time with the fashionable socialite and gossip Princess Betsy and her circle, in order to meet Vronsky, Betsy's cousin. Vronsky continues to pursue Anna. Although Anna initially tries to reject him, she eventually succumbs to his attentions. Karenin warns Anna of the impropriety of paying too much attention to Vronsky in public, which is becoming a subject of society gossip. He is concerned about his and his wife's public image, although he believes that Anna is above suspicion. Vronsky, a keen horseman, takes part in a steeplechase event, during which he rides his mare too hard and she falls and breaks her back. Vronsky escapes with minimal injuries, but Anna, in a state of extreme distress and emotion, confesses her affair to her husband. Karenin asks her to break off the affair to avoid society gossip and believes that their relationship can then continue as previously. Levin resolves to forget Kitty. However, a chance sighting of Kitty in her carriage makes Levin realize he still loves her. In St. Petersburg, Karenin crushes Anna by refusing to separate from her. He insists that their relationship remain as it was and threatens to take away their son Seryozha if she continues to pursue her affair with Vronsky. However, Anna continues to pursue her affair with Vronsky. Karenin begins to find the situation intolerable. He moves out, taking his son with him, and planning a possible divorce. Meanwhile, Kitty's parents and Stiva play matchmaker with Levin: they arranges a meeting between Levin and Kitty which results in their reconciliation and betrothal. Karenin changes his plans after hearing that Anna is dying after a difficult childbirth. At her bedside, Karenin forgives Vronsky. Vronsky, embarrassed by Karenin's magnanimity, attempts suicide by shooting himself. He fails in his attempt but wounds himself badly. Anna recovers. She hears that Vronsky is about to leave for a military posting in Tashkent and allows him to come for a final farewell. Vronsky is intent on leaving for Tashkent, but changes his mind after seeing Anna. The couple leave for Europe - leaving behind Anna's son Seryozha - without obtaining a divorce. Stiva finds himself pleading to Karenin on her behalf to free her by giving her a divorce, but Karenin refuses. In the end, one way or another, he believes his wife will come back to him. In Italy, Vronsky and Anna are happy for a time, but Anna misses her son. They return to Russia. In Petersburg, Anna and Vronsky attends a show at the theatre at which all of Petersburg's high society are present. At the theatre, Vronsky's mother makes a deliberate scene, asking how much longer Anna can keep her son's love by beauty alone. Anna is devastated and collapses. It becomes clear that while Vronsky is able to move in society, Anna is barred from it. She starts to become very jealous and anxious that Vronsky no longer loves her. Anna uses morphine to help her sleep, and now is addicted to it. Anna starts to think of suicide as an escape from her torments. Anna's confusion overcomes her, and in a parallel to the woman's railway death when she first met Vronsky, she commits suicide by throwing herself in the path of a train. A group of Russian volunteers, including Vronsky, who does not plan to return alive, depart from Russia to fight in the Orthodox Serbian revolt that has broken out against the Turks. 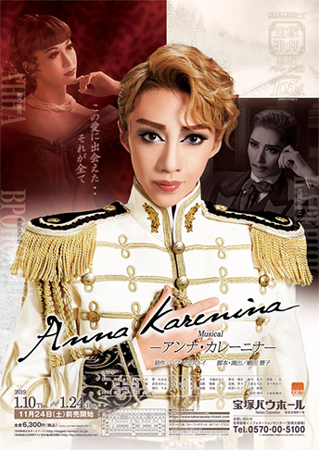 Anna Karenina was first performed by Snow Troupe in 2001, starring Asami Hikaru and Konno Mahiru. It was revived in 2008 by Star Troupe as a double cast, with Yumeno Seika and Aono Yuki in the lead roles, followed by Mahiro Shun and Hisaki Seara as the leads. Created by lokai. Last Modification: Monday 25 of February, 2019 05:09:07 PST by caithion.